As an esteemed member of the Wizzley community, you have already experienced the benefits of writing here first hand. Why not invite your friends and followers to join in the profitable fun and gain some additional income from your referrals? With these eye-catching banners and graphics, you are sure to get their attention, especially if you combine your efforts with a personal recommendation. Remember though, that you will only reap benefits from recruiting good quality writers, so be a little conscientious where you place these banners. Banner exchanges, and other questionable methods of promotion, will most certainly not get the desired results and should be avoided. To use these banners, copy the image to your hard drive and upload to your favorite image hosting service. Use with your personal referral link (substitute yourid with your own ID). Or, if you prefer, copy and paste the code snippets below each banner. What other banners or buttons would you use? Not promising anything, but what if? 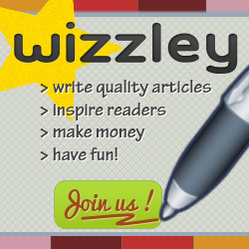 Want a header for your Wizzley Widget? Our Wizzley Widget is a great way to show off your articles (or those of other authors) on sites which allow the embedding of iframes. It is intentionally kept clean and plain to allow for greater flexibility, however, some of you might want to combine it with a nice header graphic. These are 280px wide, so you need to modify the embed code to make the widget fit perfectly underneath. Change the "width" parameter to 274px (instead of 320px) and it should fit into most blog sidebars. nightowl, Thank you for the codes. Do you have any statistics as to which colors and sizes are the most popular? I have places these might work. Thanks. Thanks for the tips. Since I'm new here I am looking for all the information I can get. Glad you like them, @Dustytoes. Let me know if you require specific sizes. Thanks so much for those pretty Wizzley Wedding banners! Yay...! Very cool Wizzley banners. These banners seem to be a little more conveniently sized for my other websites and blogs. Thanks for posting them Nightowl! thanks so much, could you come up with a circular one? Fed up of not having enough hours in the day? It could be that you're not using the time wisely. It's time to become a more productive writer.